Yes, I do love living in a small town. I love everything about a community that works together to support local artists. I also believe in keeping local money in our own communities whenever we can. 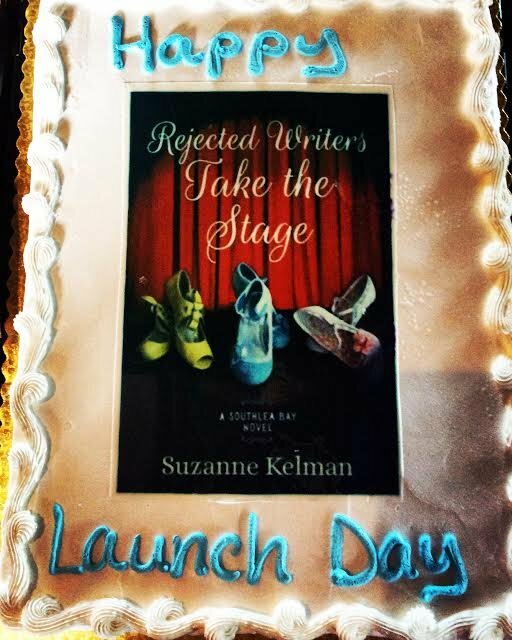 So, it was an easy decision when I came to launching my next book, “Rejected Writers Take the Stage,” to have a party downtown, especially as my book is set in Langley! It’s always exciting for authors to get their hands on the first copy of their work. I don’t know about other writers, but it always makes me cry. It is as if all those electronic manuscripts, internet emails, and flat graphic covers are a fantasy until you actually hold that work in your hand as a physical book. This was the second book in my Southlea Bay Series, and it was the most difficult piece of writing I have attempted yet, for many different reasons. First, I had some health challenges for a lot of the time I was writing it and being in acute pain is not the best environment to write comedy from. Secondly, I felt that “second book” pressure, I didn’t want to let down the people who had loved the first books so much. And lastly, I had to figure out some difficult, key plot points. So, it was with joy and relief that I finally received the copy that had cost me so much in time and energy. With my new book in hand, all that was needed was to plan the physical launch party. I decided on Ott & Murphy for my venue. If you haven’t visited this wonderful place, I highly recommend you do this summer. Located on First Street, with its stunning views of the sound, fabulous wine, and marvelous entertainment, it is well worth stopping by for a glass of vino and plate of cheese. 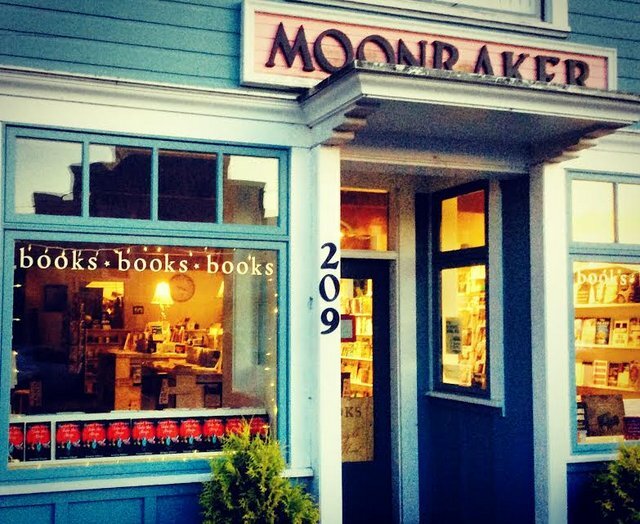 Next was the books, and of course I wanted to include Moonraker, our local bookstore, which is also on First Street. I do get author copies, but I wanted this to be a celebration of the small town I live in, so inviting them to participate by providing the books seemed the right thing to do. As I went to check final arrangements with them, not only was my book in pride of place on their counter, but they had also filled the window with copies, too. Have I told you yet how much I love my small town? With the venue and books arranged, and the cake order from Payless, all that was needed was to organize the entertainment for the event. Once again, my small town came to the rescue. A talented group of local actors agreed to bring my characters to life, pulling them straight from the page in their own unique interpretation of the parts. It was wonderful to sit back and be read to and also to see hidden depth brought forth from the characters as they were re-created in front of me. Here is a photo of them hard at work. 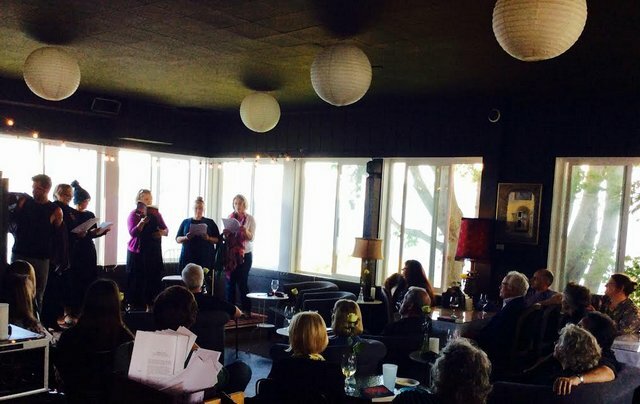 As the event went off without a hitch, I felt my heart swell, I’m so glad I decided to write about a small town and that I get to reap the benefits of living in one every day. A big thank you to all of you who contributed to this wonderful launch. 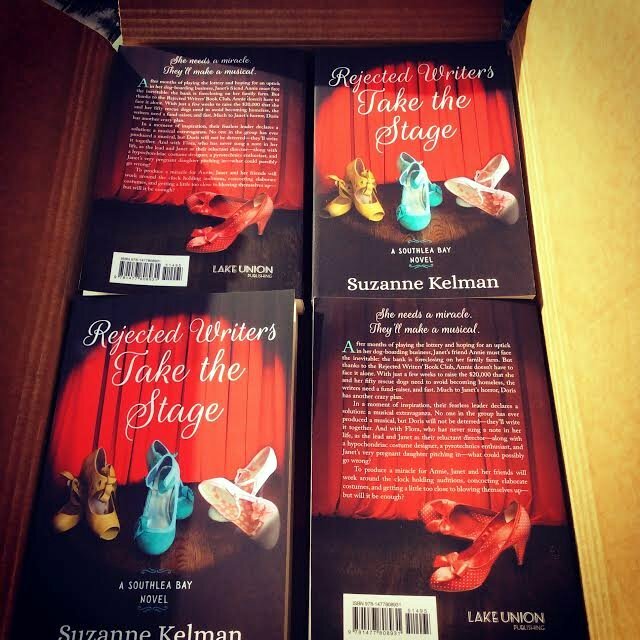 Suzanne Kelman is the author of “The Rejected Writers’ Book Club” and “Rejected Writers Take the Stage.” She is an award-winning screenwriter and playwright and was a Nicholl Fellowship Finalist at the Academy of Motion Picture Arts and Sciences. Kelman was awarded Best Comedy Feature Screenplay at the L.A. International Film Festival, received a Gold Award at the California Film Awards, and received a Van Gogh Award at the Amsterdam Film Festival. Enjoy more articles in the print edition of Whidbey Life Magazine, which you can purchase at local and off-island retailers or receive in the mail via subscription. 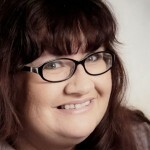 WLM stories and blogs are copyrighted and all rights are reserved. 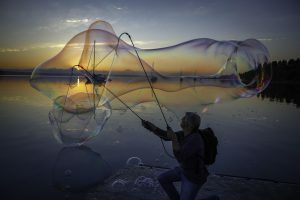 You may link to this story. To request permission to use or reprint content from this site, please contact us.